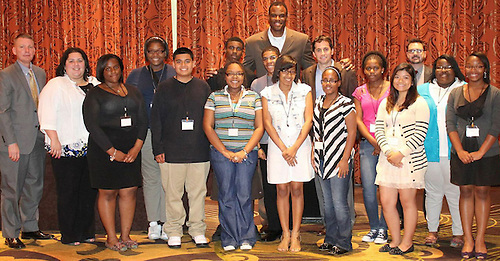 NBA Hall of Famer and philanthropist David Robinson is partnering with the University of Houston’s Hilton College, Hilton Worldwide and American Liberty Hospitality to create a scholars program that will provide HISD high school students with a pathway to a degree and career in the hospitality industry. The Admiral Hospitality Scholars (AHS) program was announced by Robinson at a kick-off event on May 20 on the University of Houston campus. This entry was posted in Achievement/Recognition, High Schools and tagged Admiral Hospitality Scholars, Barbara Jordan High School, David Robinson, Davis, Worthing, Yates on May 21, 2013 by HISD Communications. Three student ambassadors took the African-American Advisory Committee on separate tours of the Yates HS campus. Members of the HISD African-American Advisory Committee held their regular meeting Wednesday at the historic Yates High School campus. In November, HISD voters approved a $1.89 billion bond package that includes $59.5 million to build a modern new Yates campus. HISD Community Relations Liaison Lawrence Allen who has been instrumental in assembling the group of educators, journalists, community, and business leaders said Yates High School was selected as the site of this month’s meeting because of its longstanding commitment to excellence in education, a sentiment echoed by Yates Principal Marla McNeal-Sheppard. “Although Yates has always been known for excelling in athletics, we are extremely proud of our triumphs in academics,” said McNeal-Sheppard. “There have been an increasing number of students applying for admission into our communications magnet program and in 2012 the number of scholarships increased from $2.1 million to $3.5 million dollars.” However despite the successes, she said there is more work to be done. “We’re always working to create business partnerships and to get more resources for our students,” she said. A highlight of the meeting was when three student ambassadors took the group on separate tours of the campus. Senior Talisha Rhodes who will be studying nursing beginning this summer at Prairie View A&M University was one of the student ambassadors. As Rhodes guided her group through the school’s television studio, graphic design classrooms, and printing press, she raved about what her years at Yates have meant to her. Advisory committee member Dr. Jacqueline H. Cobbin said Yates is a wonderful example of what’s right with our schools. “You can tell from walking through the halls and meeting with the students, teachers, and Principal McNeal-Sheppard how enthusiastic and energized everyone is about Yates,” said Cobbin. The African-American Advisory Committee was created in 2011 by HISD’s Strategic Partnership Department to advise and support HISD in strengthening and encouraging public support of HISD schools, improving student achievement, and increasing parental and community involvement within the African-American community. This entry was posted in Uncategorized and tagged African-American Advisory Committee, bond, Yates on March 1, 2013 by HISD Communications.